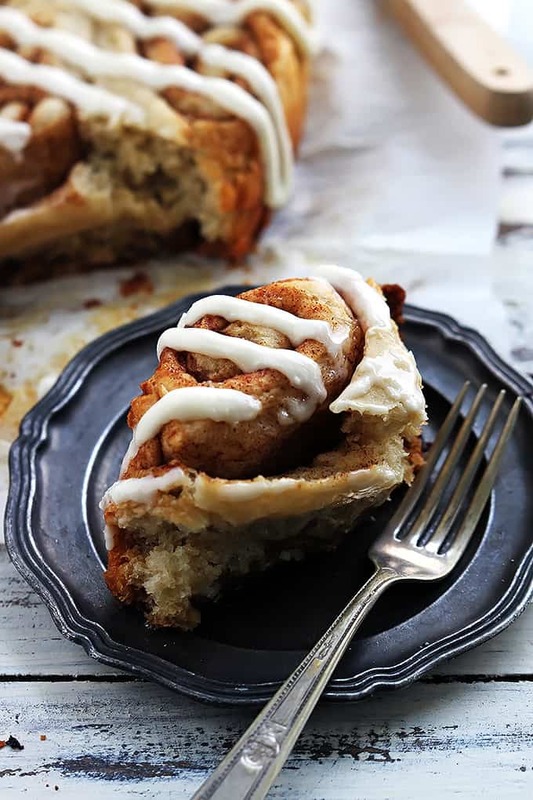 Fluffy Slow Cooker Cinnamon Rolls made right in the crock pot, topped with rich cream cheese frosting! I kind of feel like there is nothing more to say after the title of this post. 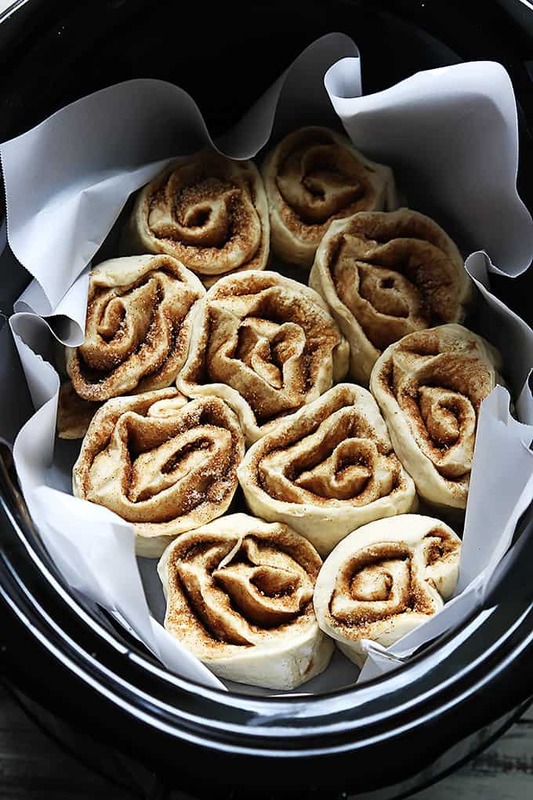 Slow cooker cinnamon rolls. The end. Do I really need to explain how incredible this break-through is?? Probably not. 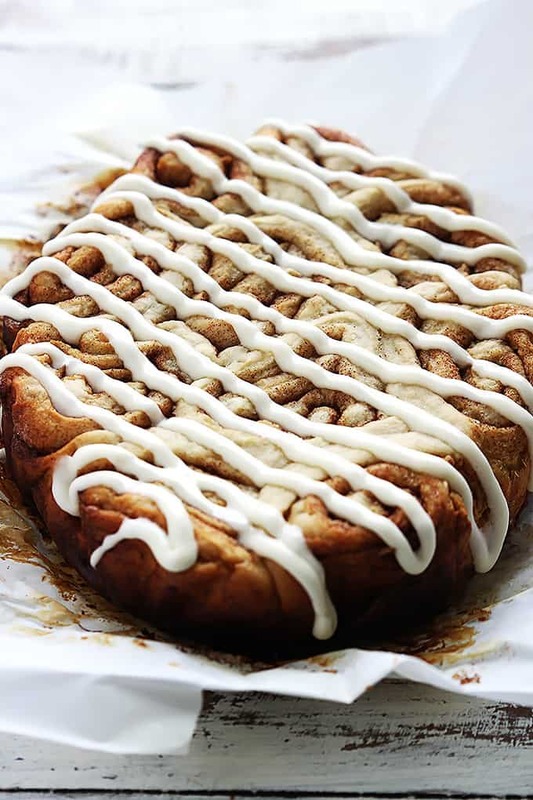 But since you’re here… and I’m here… and we have a bazillion photos to get through (went a little cray-zay on this one… sorry-not-sorry) I’ll indulge in a few words about the wonderfulness that is crock pot cinnamon rolls. 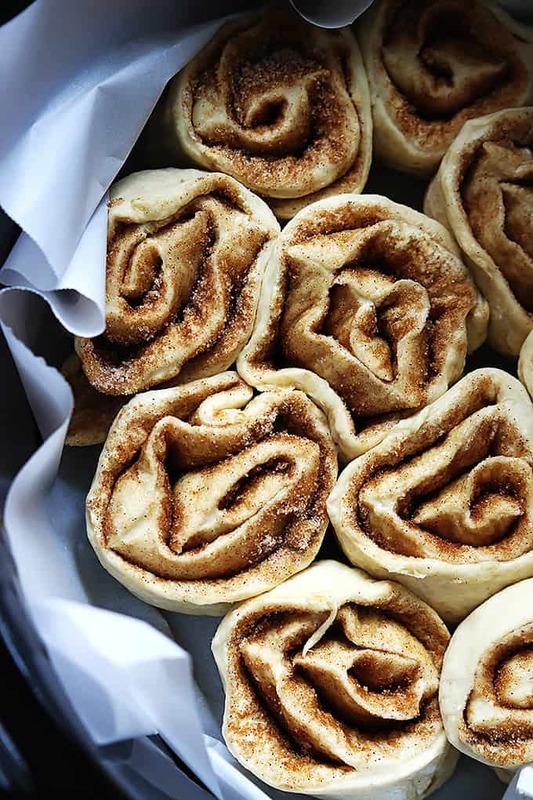 First off, these are honestly the easiest made-from-scratch cinnamon rolls ever, x10. I made these with my favorite Miracle Dough recipe – have you tried it yet? You can check it out HERE. This dough is the b.e.s.t. because it only requires 5 simple ingredients and 30 minutes of your time. That’s right, 30 minutes start to finish including rising time. 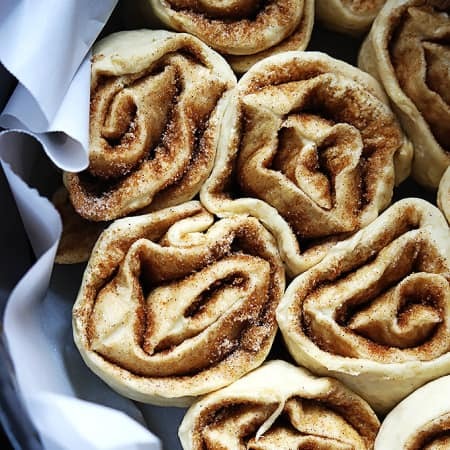 So that means that the dough for these slow cooker cinnamon rolls only requires 30 minutes of prep before you roll em’ up and stick them in the crock pot. 1) EASY. No fuss, no crazy ingredients, no weird chilling time, etc. 2) QUICK. It’s Christmas morning, the last thing I want to do is slave away in the kitchen for hours – helloooo, Santa just came, I have a stocking to get to. 3) SPECIAL. And by special I mean magical-Christmas-morning-worthy. 4) EXTRA SUPER DELICIOUS. Ummmm, yeah, you get it. 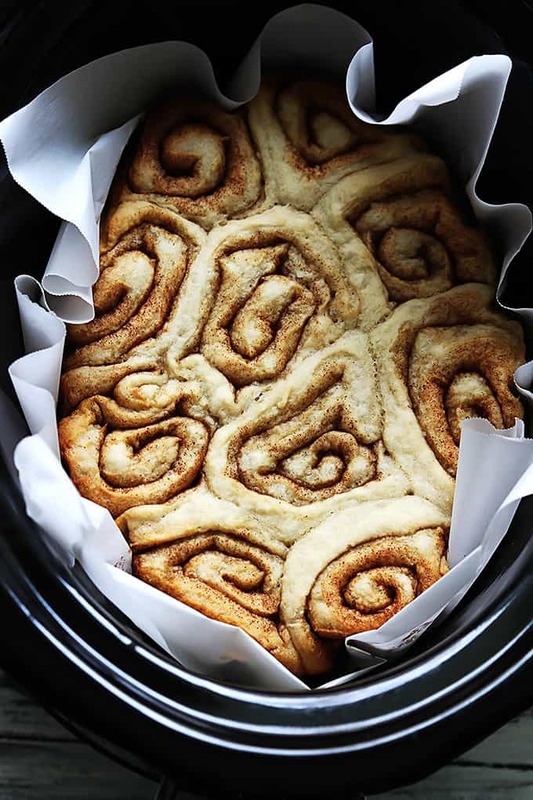 So this is what I came up with: slow cooker cinnamon rolls. 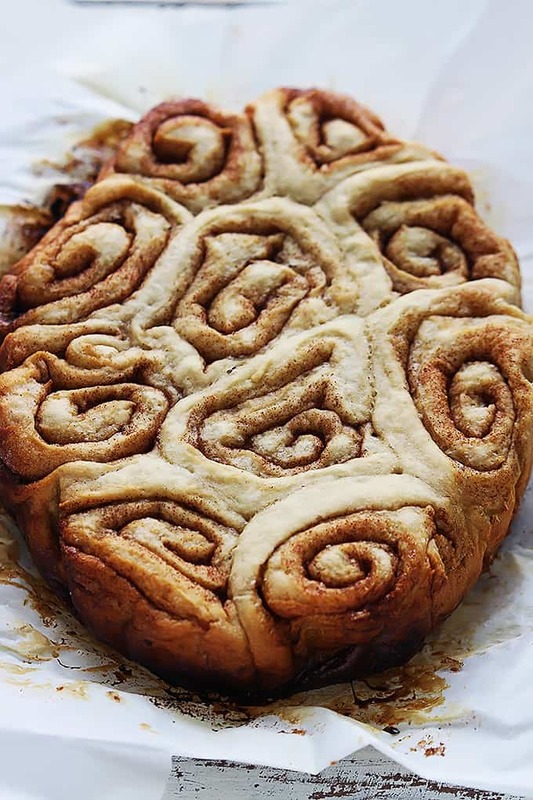 My thought is this: prep the rolls, throw them in the crock pot, go have your Christmas morning magic, then BAM, best-ever cinnamon rolls waiting in the kitchen. Easy homemade cinnamon rolls made right in the crock pot, topped with rich cream cheese frosting! Add water, yeast, and honey to the bowl of a stand mixer fitting with a dough hook and stir to combine. Allow to rest for 5 minutes (mixture will rise and foam). Add flour and salt to bowl. Turn the mixer on low and allow to mix until ingredients come together, then increase mixing speed to medium-low for 5 minutes. Remove dough from bowl and allow to rise for 10 minutes on a lightly floured surface. While dough is rising, prepare the filling by whisking together sugars in a bowl. Use a floured rolling pin to roll dough into a 9x15 inch rectangle. Use a pizza cutter to trim off the sides if it isn't perfectly rectangular. Spread softened butter over the surface of the dough. Sprinkle cinnamon-sugar mixture over the butter. Tightly roll one 15-inch side (the long side) of the dough toward the other 15-inch side to create a long log. Pinch the seam so it closes off the log. Use a very sharp knife or a pizza cutter to cut the ends off and then to cut the log into 10-12 equal parts. For the frosting, cream together butter and cream cheese for 2-3 minutes until very fluffy. Add vanilla and mix until smooth. Add powdered sugar one cup at a time, mixing after each, and add milk 1 tablespoon at at time until frosting is smooth and spreadable/pourable. 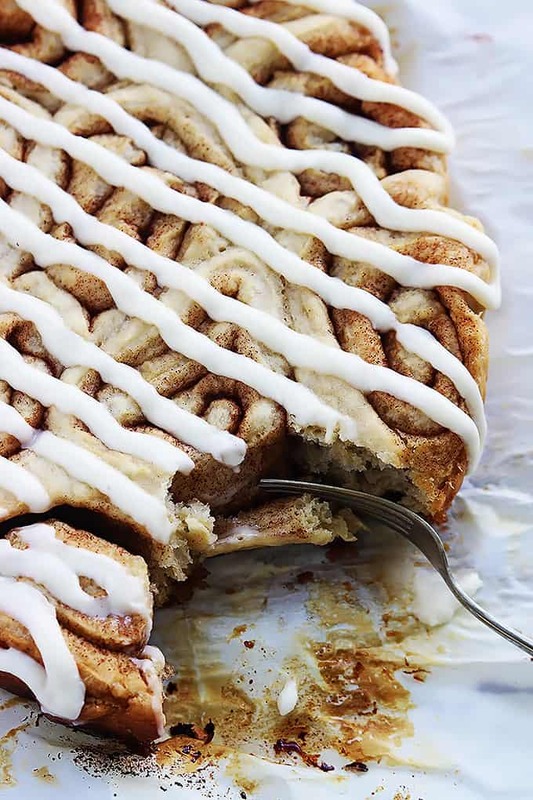 Spread or drizzle over warm cinnamon rolls. This recipe is made using Miracle Dough. I’ve never made cinnamon rolls and have been thinking of them all morning, trying to decide which recipe to eventually try. I love the ease of yours and am pinning this for sure! I would have never have thought of this Tiffany – what a fantastic idea! Are you kidding me??!! You’re a genius. And gorgeous photos, as always! You know I really kick my cravings for fresh cinnamon rolls by keeping in mind the hours ahead of me before they’re done but you’ve killed that. I can now make cinnamon rolls ahead of time and have them around whenever I want…Genius…evil genius! Pinned! Duuuuude I’m all over this. i unfortunately don’t have a stand mixer yet 🙁 is it possible to make these without? would love to have these for christmas morning! Also I made the dough in my breadmaker knead only cycle, it’s another option. I can no longer knead dough due to nerve damage in my hands and shoulders. I only have self rising flour would that be ok? I’m new to baking. I made these tonight and they were great! Mine did take close to 4 hours to cook but my crockpot was chuck full and the rolls were huge. I also picked up the rolls on the foil and put them under the broiler in the oven for a few minutes to brown. They were great and I will definitely make them again as they were sooo easy. Do you put the lid on the crock pot? Perfect recipe, I only had to make sure I had the right measures in Dutch but I found it on the net so no problem, I left it in the cooker for 2 hours en it was lovely I am sure I will make it again, it will be a favourite! Hi Morgan, yes I’ve made these the night before! I made them, place them in the crockpot, and stuck those whole crockpot insert in the fridge covered in plastic wrap with a paper towel resting on top of the cinnamon rolls (to collect residual moisture) – they required extra baking time because the crockpot was cold but they came out great! Hi Jackie, I used a 6-quart crockpot for this recipe. Great idea! Love your website! your recipe calls for active dry yeast – can you use instant or quick? Can the dough be prepped in advance? Say the night before.. These look awesome! I’m at my in-laws and they do not have a crockpot….can I make these in the oven? i only have a hand mixer, is it ok to use them? I don’t have a stand mixer..